California Archives - Blackburn Architects, P.C. : Blackburn Architects, P.C. 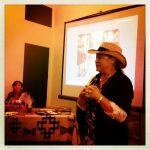 Patty Brutten, the farm owner led off the presentation with introductions and a brief history of what led her to build Lucky Jack Farm. The property was designed in the Rancho Santa Fe historic style made famous by Lilian Rice in the 1920’s and has an historic designation characterized by low-slung terra cotta roofs, shuttered, deep-set windows, white or neutral colored adobe walls, and intimate patios and courtyards, that define the area. Today it is known as California Romantica, California Mission, or Spanish Colonial style. All of the author proceeds for the sale of John Blackburn’s book, Healthy Stables by Design, are donated to equine charities. The owners of Lucky Jack Farm, hosts of this event, chose REINS Therapeutic Riding Program in Fallbrook, CA. Debbie Shinner, who has been the Executive Director of REINS since 1995, spoke about the program, its history, and how she became involved in 1992. Our own John Blackburn followed Debbie with an introduction of some of the key members of the design and builder team, a short presentation about his background designing for horses, and the design aspects he believes to be essential for successful equestrian projects. 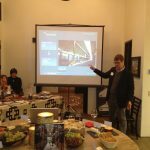 He also covered design concepts of his firm’s predesigned Blackburn Greenbarns® as well paying notice to several projects in the book, Healthy Stables by Design. 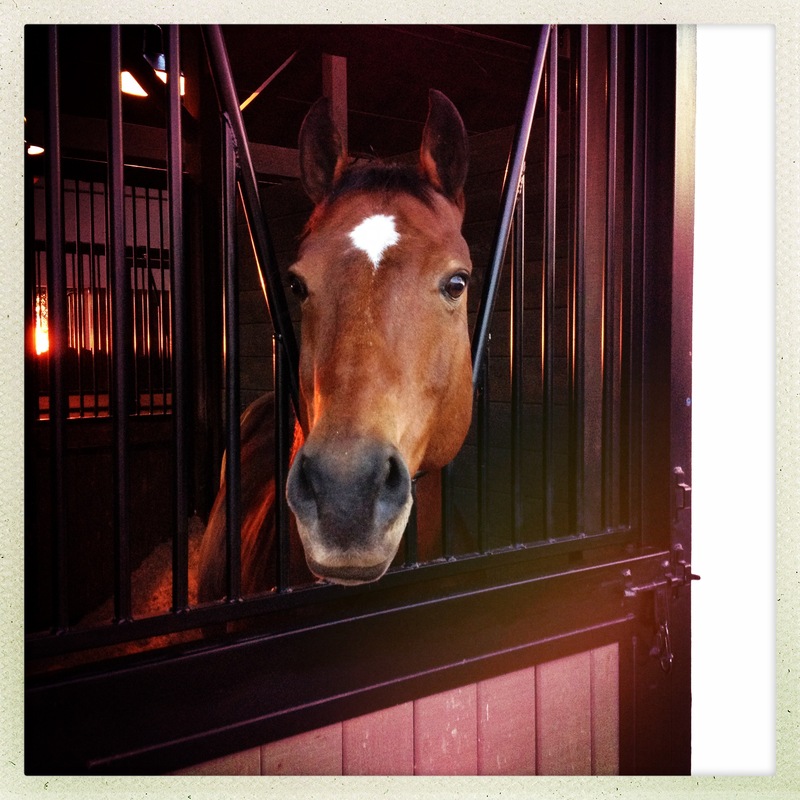 As he does in every presentation, John stressed how the health and safety of the horse remains the priority in every design regardless of the budget, location, or program. 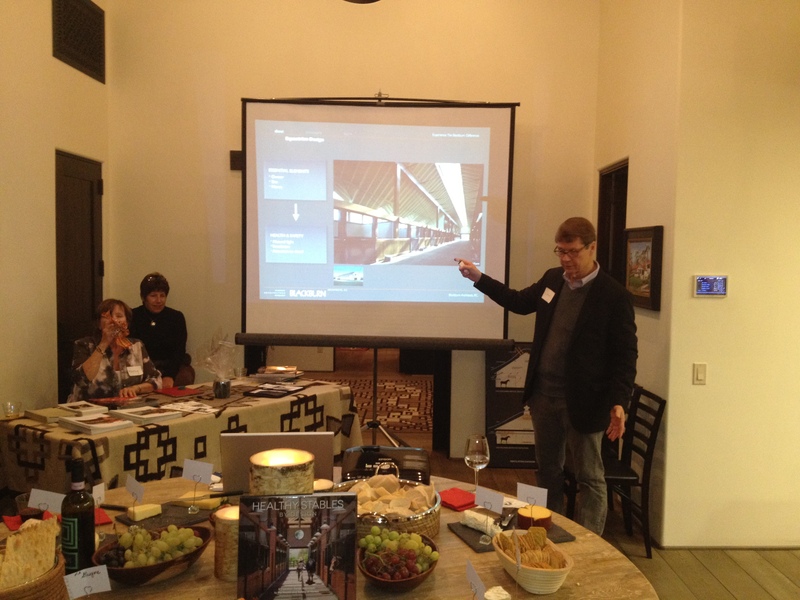 Following the presentation, Blackburn architect, Dan Blair led a portion of the attendees on a tour of the Lucky Jack Barn, illuminating its unique design aspects and how the firm tackled the challenge of having the barn’s designs comply with strict building and fire codes without sacrificing a healthy and safe environment for the horses. 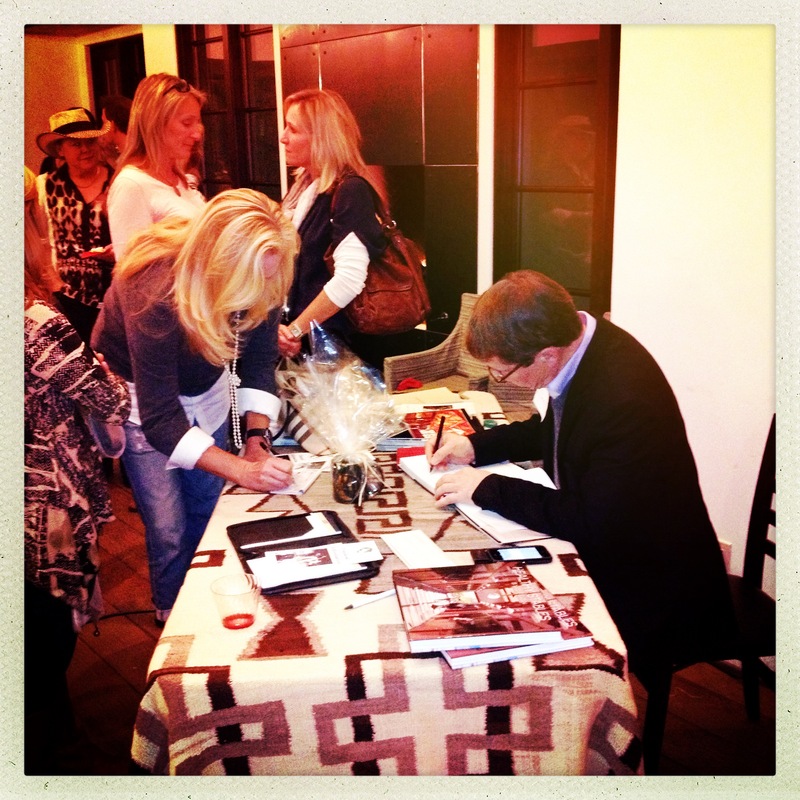 The event ended with the sale of 64 copies of Healthy Stables by Design and raised nearly $2000 for the charity. This amount was increased significantly by several private voluntary donations. John continues on his book tour and equine charity events with presentations in Pebble Beach and Monterey CA and at a private facility in Central California in the Bay Area. 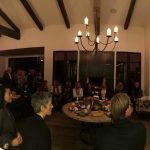 Scroll down for pictures from the event. 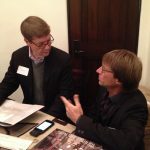 John with David Hartig, photographer who captured all the beautiful images of Lucky Jack Farm in the book and the cover shot. 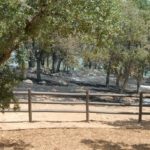 With all the recent horror stories we have been hearing about the wild fires across the southwest and California, it is nice to hear a good outcome on occasion. We received such an email last week from one of our clients. 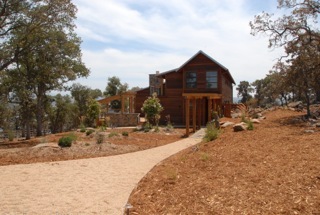 The message notified us that their residence, designed by Blackburn Architects, PC and constructed by Crocker Homes, found itself in the middle of the Seven Fire, a wild fire, that blew through the foothills of the Sierra Mountains on July 10th. 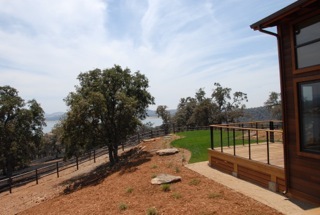 Finished earlier this year, the four bedroom, 3,950 square foot private residence is located in Seven Legends Ranch overlooking Lake Don Pedro. 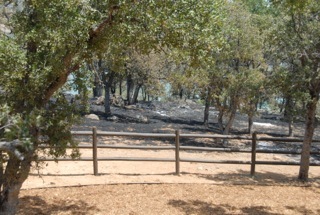 Luckily, the wild fire was first spotted by a plane that was helping fight another fire in the area. 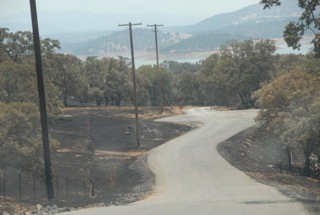 According to authorities, the fire destroyed over 800 acres in a very short period of time. 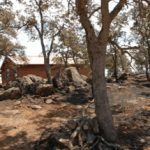 Though the entire area around the property was consumed by the fire, the house survived the conflagration due to the defensible space fire protective measures installed during construction. 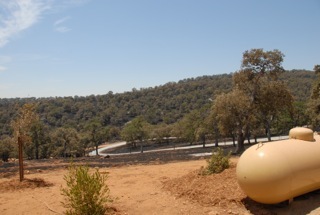 Defensible space fire protection measures, also known as “firescaping,” are fire control methods instituted in the California code that focuses on the landscaping around a building. The concept targets the area within 100 feet of the building and emphasizes fuel reduction by specifying appropriate spacing and separation of plant types. Plant selection, segregation, and spacing all play a major role in preventing the spread of fire between different types of vegetation and in an effort to reduce its ability to reach the structure. 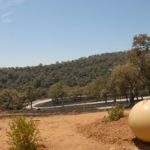 Although the design and installation of the measures tend to add to the initial cost of construction, they have been proven to work. Not only does this helps save lives, but it also helps prevent rising insurance costs in the country’s fire prone areas. 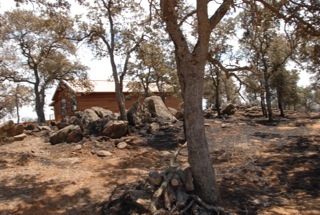 In Seven Legend’s case, the firescaping provided sufficient time for the local fire department to deploy to the property, spray the home with fire retardant, and save it from being completely destroyed. Our thoughts go out to all those who have not been as fortunate. 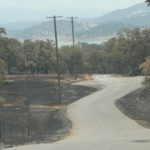 Photos and news footage below. 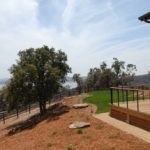 Just over a year ago, I wrote about visiting a project in Rancho Santa Fe, California that had just began construction. A year later, I am happy to report that the construction effort is complete and was a great success. Lucky Jack Ranch, as its owners have christened it, is located in Rancho Santa Fe California and is made up of a 3,900 sq. ft. clubhouse with guest residence, a 15-stall barn plus a large wash stall, six outdoor tacking stalls, and an open riding arena. The Ranch also has a famous neighbor: the Pacific Ocean. The family’s private equestrian facilities take full advantage of seven acres of the site, with the structures placed upon an overlook to capture Pacific Ocean breezes, not to mention an ideal view of the sunset. 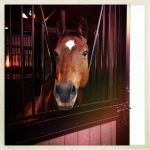 The Ranch emphasizes the leisurely aspects of horse riding, from cool-down trails surrounding the property to a large patio that invites riders to relax and socialize after riding. There’s a romantic feel to the architecture, which was designed as a modern tribute to Lilian J. Rice, the architect responsible for much of the site planning and architectural design within the community of Rancho Santa Fe as it formed around 1922. The architecture is heavily influenced by Spanish and Spanish Colonial design, using stucco, terra cotta, and wood accents. 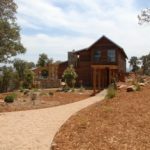 A trellis stretches from the clubhouse to the barn to connect the Ranch visually. The property focuses on an ultimate rider experience, apparent in the full amenities at Lucky Jack (there’s even a wood burning pizza oven), but there’s no mistaking that this is a serious working horse ranch; complete with a hotwalker, round pen, custom Lucas Equine stall systems that include indoor and outdoor wash stalls, a tack room, and several areas for riders to lounge and observe the activity of fellow riders. A fully equipped kitchen and dining area in the clubhouse opens to a smaller, more intimate patio space for dining al fresco while the main patio (with that enviable, wood burning pizza oven I mentioned) prompts larger gatherings. Lounge chairs and tables invite riders and non-riders alike to relax and take in the refreshing ocean breezes and unwind. The owner’s family and friends can even stay in the clubhouse, which has two bedrooms, terraces, and a laundry room. The only real difficulty might be getting guests to leave. 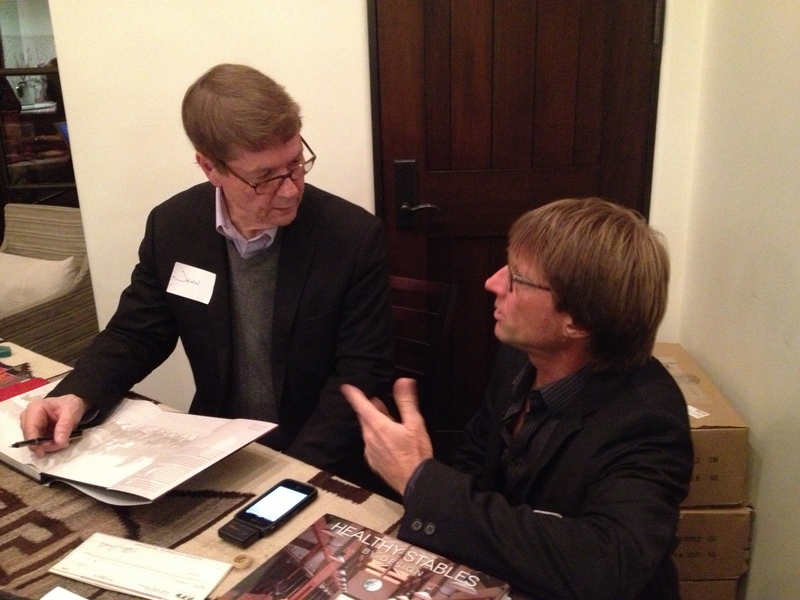 Allard Jansen Architects, Inc. of San Diego was a local design consultant and permit facilitator for the project. 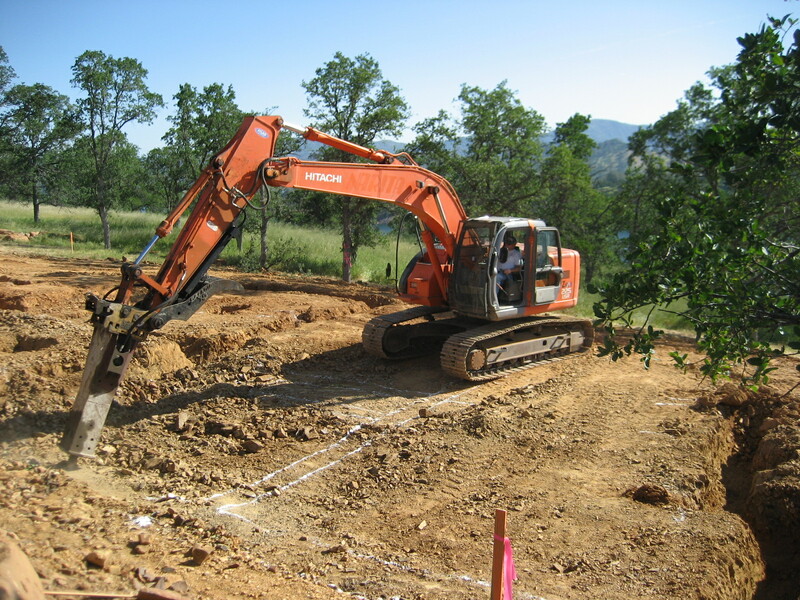 On a recent trip to California, I had the pleasure of stopping by one of our project sites in Tuolumne County to check its construction progress. 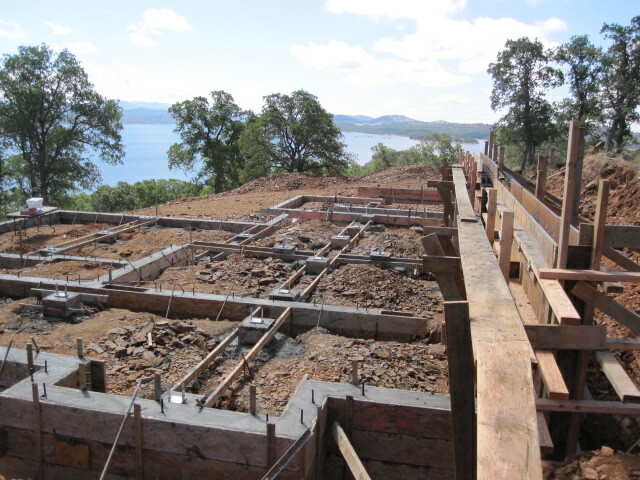 The contractor, Crocker Homes Inc., recently began the foundation work for a new residence at Seven Legends Ranch, which looks fantastic. What a view! 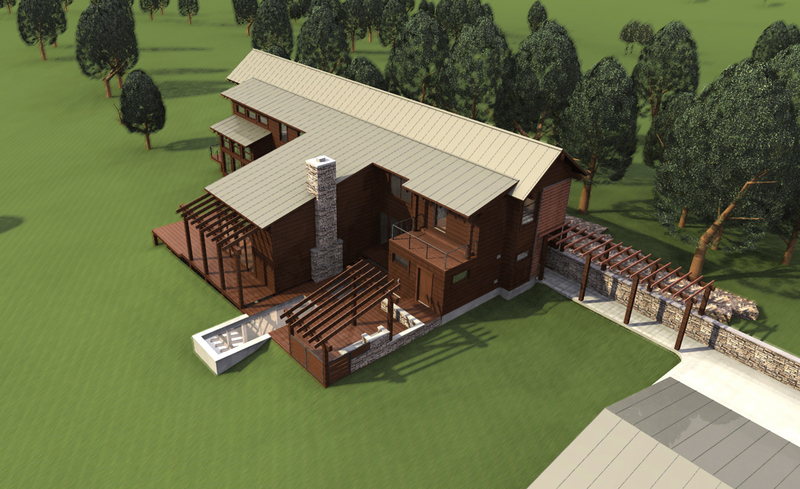 When completed, the ranch’s program will include a main residence, a six-stall barn, and a guesthouse, all of which will incorporate heavy timber and western red cedar siding. 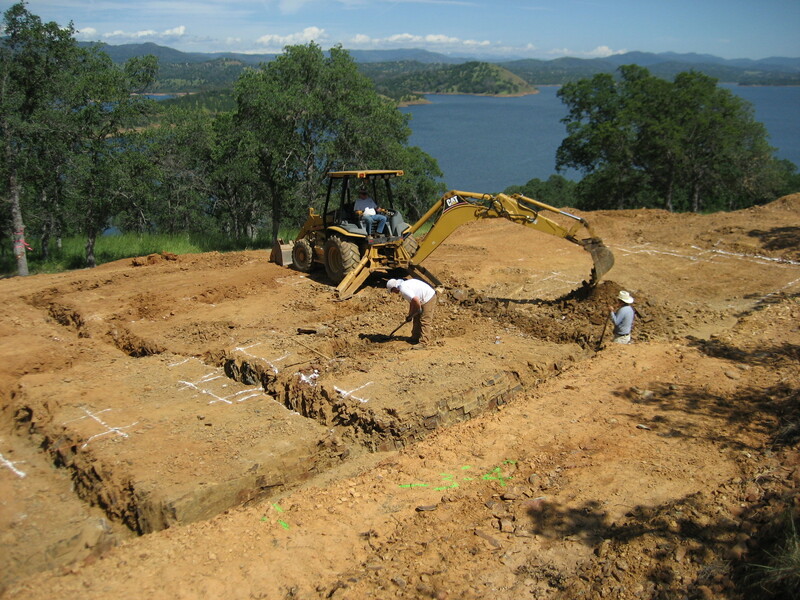 We’re very excited to watch the progress continue and hope that the owners, at this same time next year, will enjoy their new home while relaxing in the Sierra Foothills and enjoying the breathtaking views of the snow-capped peaks of Yosemite National Park in the distance. Rendering by Blackburn Architects, P.C.